There are so many superstar moms to celebrate this Mother’s Day and each is special in her own way. 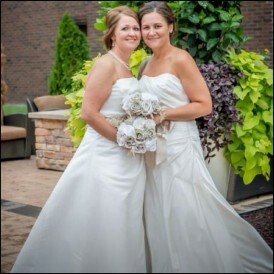 Today, Lesbian.com wants to celebrate lesbian moms everywhere by introducing you to Steph and Brooke who are mothers to two amazing children, are foster mothers to two more and provided donor eggs and surrogacy for their best friends and sperm donors, Chris and Dakota. They have been friends with gay couple Chris and Dakota for years. Brooke and Steph even lived with Chris when they were all in need of a roommate. 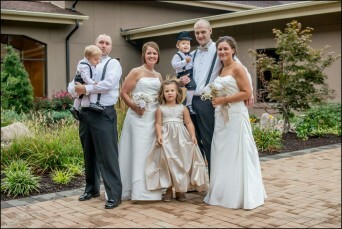 The two couples had a firm friendship and when Chris found out that Brooke and Steph were thinking of starting a family he approached them and offered to help, and asked if they would consider doing the same for him. With the spirit of generosity and kindness, the two couples embarked on their journey to create their “modern families.” I spoke with Brooke and asked her to share the details of their arrangement from legal rights, to logistics, to juggling boundaries between the two sets of parents. How did you come up with this arrangement and hammer out the details? Once Steph and I began talking about starting a family we sat down and decided what was most important to us. We both have a strong passion for kids and shared the same opinions on what kind of life we wanted for the future. We talked about our own childhood, and from that took both things we wanted to carry on to our children and things we wanted to do differently. During that process, we decided that we still wanted a male figure in our kids’ lives. We wanted this person to be okay with the child knowing who they were and be there for the big parts of their lives. Basically an uncle figure but with no obligations at all. Let me add a disclaimer here by saying we do not by any means believe that families who use unknown donors are in some way depriving their children, we just did what felt right to us and our family. Once we talked we realized we all wanted our kids to know who their mother(s) and father(s) are and be present as an aunt/uncle-type figure in their lives, but with no financial or legal responsibility on the part of the donor or surrogate biological parent. So, once a child is born there is an adoption and signing over of rights. How did you “do it”? We performed artificial insemination at home. Steph is a nurse so we were able to do everything safely. The boys would leave their “sample” or drop it by. We have never looked at it as giving up a child. It feels like you are giving it back. There is nothing that can describe the feeling of a seeing a parent hold their baby for the first time and knowing you were able to give that to them. We all see each other as often as we can and are always there for the big events, birthdays, etc. What was the hardest part of piecing together your “modern family”? What was the best part? I think there were different hard parts for each one of us. With our first child it was definitely just trusting everyone involved. We are human and sometimes we don’t know how we will feel until we are put into a situation. It has actually gone remarkably smoothly over the years and it seems the only time anything has ever turned negative has been when someone not in our arrangement tried to involve themselves. People tend to get wrapped up in the “fairness” of the arrangement and really have a hard time understanding why we chose to do things this way. We have learned the key is to be very honest, open and to make sure we stay true to what we wanted from the start. The best part has been the ability to give each other such an amazing gift. It also amazes us how successful our situation actually was/is. There could have been so many things go wrong and things could have been a disaster but it really did work out the way we all wanted. From left to right: Daniel (child), Dakota, Steph, Avery (child),Cooper (child), Chris, Brooke. We make it a point to do Christmas and the kid’s birthdays together. It is really not much different than most families who have multiple stops on a holiday. We always make sure we get together though even if it is after the fact. What do all of your families think of the arrangement? I think we have all been blessed with great family members who have been very supportive. The hardest part has been for everyone to know exactly where they stand. Especially with the grandparents involved. With every child the parents of the “donor/surrogate” were never sure if they should come to the hospital or tell people they had another grandchild, etc., but regardless they always found their place and what made them comfortable. Needless to say all of our kids get extra spoiled from multiple grandparents. We are pretty laid back and, as with most of our holidays, we surround ourselves with family, food and just relax and enjoy. Even though we have children that have two moms and two dads and we consider ourselves a big family, we live our daily lives as two separate families. For Mother’s Day we will celebrate with our kids and our own moms, while the boys will do the same with their own family. We usually get a picture or a call from one another for well wishes on days like this since the kids are still young. When they get older and want to spend the day with that mom or dad then we will be a bit more involved. Brooke and Steph continue to challenge traditional notions of family in more ways than one. In addition to their “bio” kids, the women are also foster parents to two little boys, who, for legal reasons, cannot be included in this article but the couple is pleased to see that the boys are thriving in their care. Many children in the foster care system have parents who are trying to pass fitness tests and get their children back, while others might find new forever homes. Either way, strong familial ties are essential for these children. In the Brooke and Steph’s view, there are “too many kids out there and not enough foster homes.” They are correct. The most recent data available from the U.S. Department of Health states that there are currently almost 400,000 children in the foster care system with over 100,000 waiting to be adopted. While I celebrate my mother today, I also am going to take a moment to celebrate all our “modern families” and the people, like Brooke and Steph, who have given of themselves to make someone else’s dream of being a parent a reality. I hope you will, too. Posted May 11th, 2014 & filed under Love.